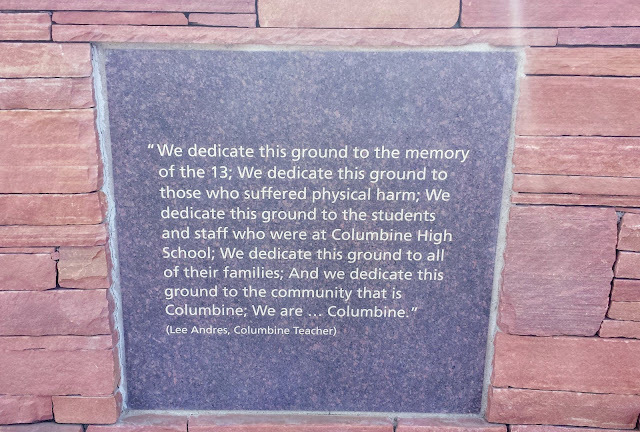 "No one ever believed it would happen at Columbine High School in Littleton, Colorado. But hopefully, people across the nation, across the state, will realize that it can happen in their school." Those were the chilling words then-Columbine High School principal Frank DeAngelis told ABC News just days after the massacre on April 20, 1999, when two senior students at the high school opened fire at the school, killing 12 of their fellow students and a teacher, wounding 21 students and then killing themselves. 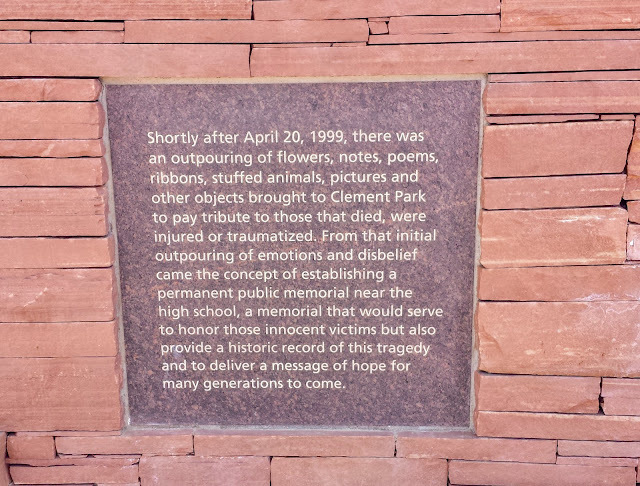 On this, the approaching 20th anniversary of the tragic event, I thought I'd show some of The Columbine Memorial in Littleton's Clement Park that was dedicated and opened to the public on September 21, 2007. It was designed to be "a place of peace, comfort, and reflection, remembering all those who were touched by the events of April 20, 1999, at Columbine High School, those who were injured, and those whose lives were taken that day." To see overhead views of how the memorial is structured as two circular rings inserted into the top of Rebel Hill in Clement Park click here. I found visiting the memorial to be a very solemn and emotional experience. 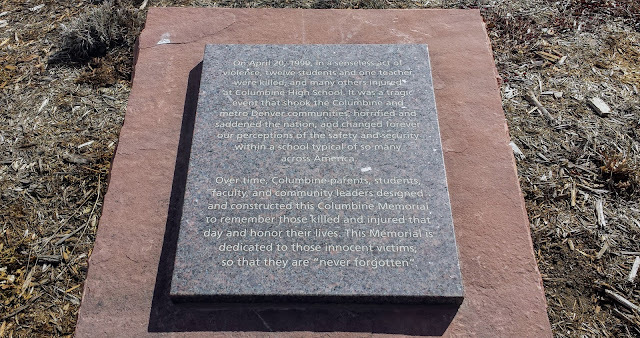 I'll never forget watching live television coverage of the Columbine High School massacre on television in my home at the time in Brooklyn, New York. I was aghast at the horror of it all. My daughter was a high school student at the time and I remember as she watched the TV coverage she commented: "How could anyone live in a place in which something like this could happen"? How could we imagine then that we would be living in the Littleton, Colorado vicinity 20 years later! As subsequent history has sadly shown, school shootings are not the plight of urban, suburban, rural, rich, or poor schools--they are the plight of this entire nation, and this generation, for reasons we still do not completely understand. 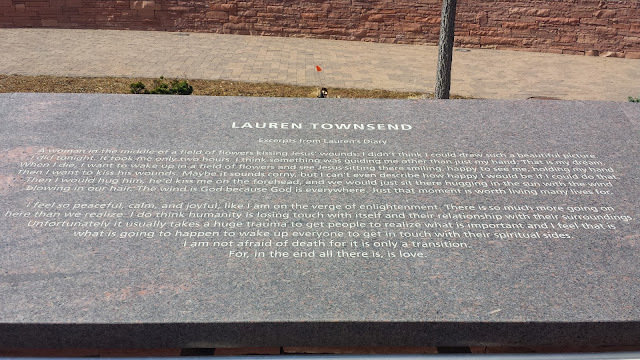 In the Ring of Remembrance, inside the memorial, each of the victim’s families was asked to provide a unique and personal reflection in a text that would honor their loved one. These remembrances were engraved in stone and stand as a tribute to the victims. 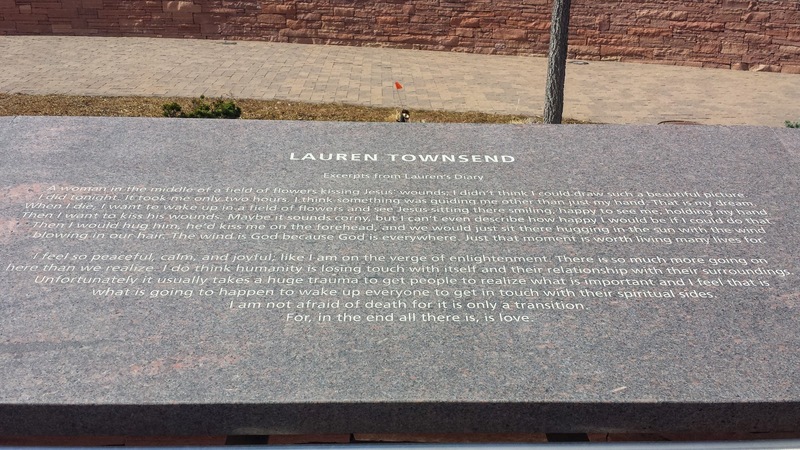 I photographed Lauren Townsend's tribute but, honestly, I had too many tears in my eyes to continue to photograph all thirteen of them. I was very sad to read the tributes to their wonderful, innocent teens and of the brave teacher, whose lives were cut short in this tragedy. 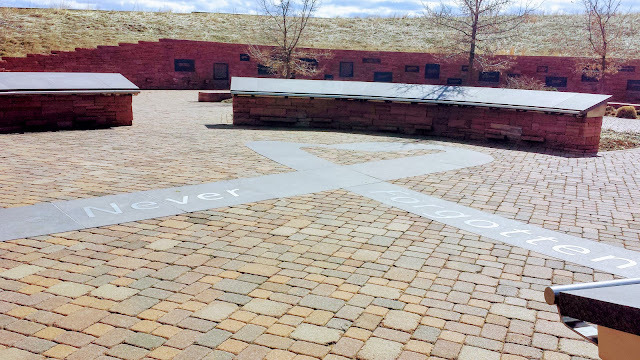 In the center of the Ring of Remembrance of the memorial lies the “Never Forgotten” ribbon designed by victim Kyle Velasquez’s parents, Al and Phyllis. If you would like to read all of the individual student and teacher tributes, you can click on this Flickr album and scroll down to see them. 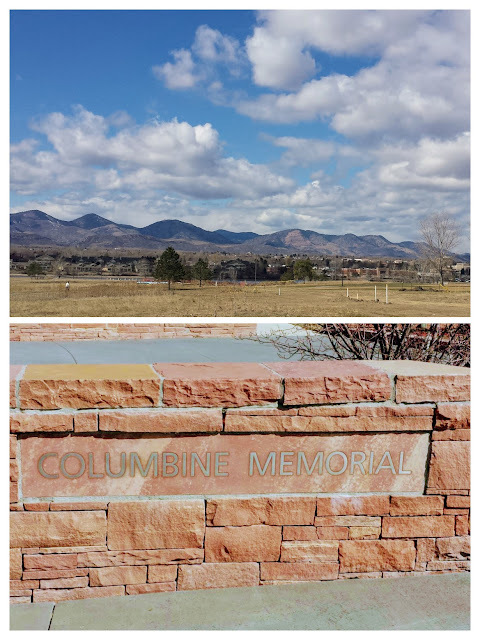 The album begins with the beautiful Columbine Memorial Garden at Olinger Chapel Hill Memorial Gardens Cemetery, and then the Clement Park Columbine Memorial. 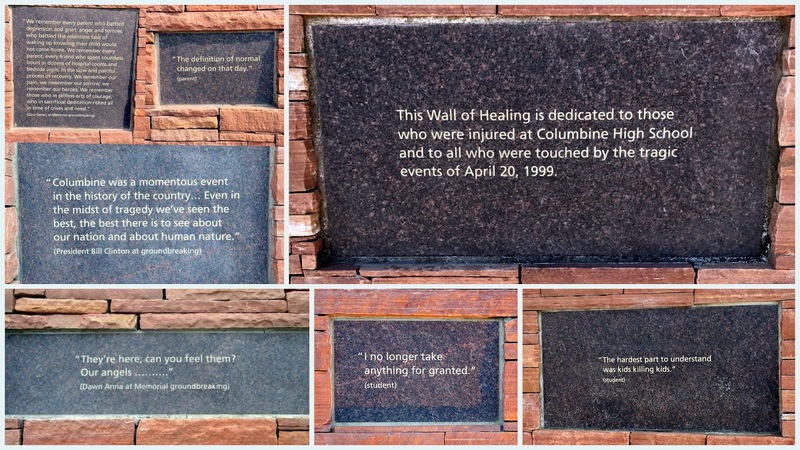 The Wall of Healing was designed to honor all those who were injured, the first responders and all those who were touched by the events of April 20, 1999. 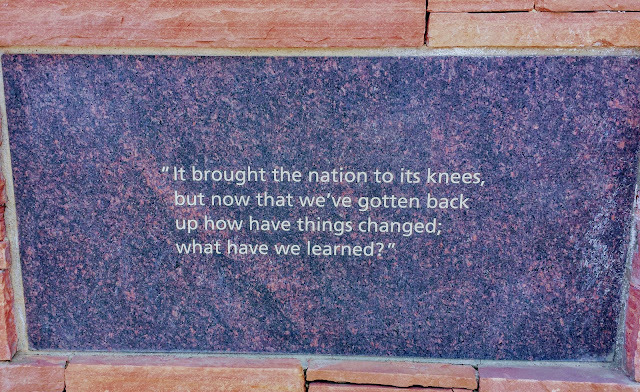 The wall consists of many engraved stones with quotes from students, the community, parents, first responders, and notable statements that were made at the groundbreaking of the Columbine Memorial. My photo collage above shows some of the inscriptions. There is an interesting article in the Washington Post--click here--which is about a security expert, John McDonald, who is in charge of school safety for Jefferson County, Colorado, where Columbine High School is located. According to the article: "...he is responsible for the safety of 157 schools and 85,000 students in a community that long ago stopped talking about a need for healing or forgiveness and started focusing on recovery and preparation." Every anniversary year, Columbine High School students have engaged in community projects as an act of honor and remembrance for those lost, and to turn a sad day into a more positive day of kindness and service. That is a wonderful thing for us all to strive for, no matter where we live--to make the world a kinder, better place. That was a terrible tragedy and unfortunately the only one. Even Finland has had one school shooting. Terrible things. It seems impossible that 20 years has passed. Thank you for sharing this memorial post. Hello, the Columbine flower is beautiful. Wonderful captures of the Columbine Memorial. That was a sad day indeed. I agree we should all strive to make our world a kinder and better place. Enjoy your day! Have a great new week ahead. And no one would have guess what came after. More of the same. So unthinkable. So sad. I remember. I lived in NY at the time, and planted columbines in my garden that year. I was never of the mindset that I lived someplace so safe that it couldn't happen here. I didn't grow up that way. My heart was instantly touched by the pain all around - the victims and the perpetrators. I've always felt it was a heart issue and laws can only go so far. Time flies so fast. I did not realize it was already 20 years. Such a sad event. It is a beautiful memorial but, oh, so very sad. Pat - hard to grasp that it has already been 20 years. It is a tough subject, but I for one am glad that you featured this in your post to keep the subject in front of us. Even one death from gun violence is too many. I appreciate your participation in Mosaic Monday! I remember so well the day Columbine happened. I was a teacher at the time and a mass school shooting was just unthinkable. Now we practice active shooter drills and teachers and students regularly wonder "What would I do if...?" So many inexplicable and evil things happen in the world. Sometimes it seems overwhelming. Fortunately I honestly believe most people are decent human beings. I was a senior at a high school just 30 minutes away from Columbine when the shooting happened. I had been to the school several times for speech competitions and had clear memories of the cafeteria where the shooting happened. It was surreal and difficult, I felt guilty sitting in my own school's library following the tragedy that my life was relatively unchanged. Thank you for the pictures of the memorial, I hope to visit someday! One of the shooter's mother's had a TED talk on YouTube. I thought it was an excellent reminder of the prevalence of mental health issues that often go unnoticed. I heard just yesterday that Volunteers of America has proven that service is an antidote for depression, so I think it's wonderful that Columbine students engage in service and hope that all high schools will incorporate service for the benefits of their students! Oh Pat, so hard to believe it's been 20 years! Thank you for sharing the memorial. I will never understand the senselessness of these shootings. God help us to do what needs to be done to end this violence. Peaceful is what comes to mind with the memorial. And poignant. 20 years already. Wow. It was such a tragedy. I grew up & raised my family in Colorado. Retired now, along the shores of the Gulf coast. But I remember this tragedy...so close to "home" - it's hard to believe 20 yrs. have passed. Too many lives lost to senseless violence. Thank you for the reminder. Was that 20 years already? As a nation we still haven't learned from that tragedy. A wonderful capture of this flower and a perfectly suitable choice for this particular remembrance. May they rest in peace and their families' broken hearts be mended. So terrible. When will we ever learn? 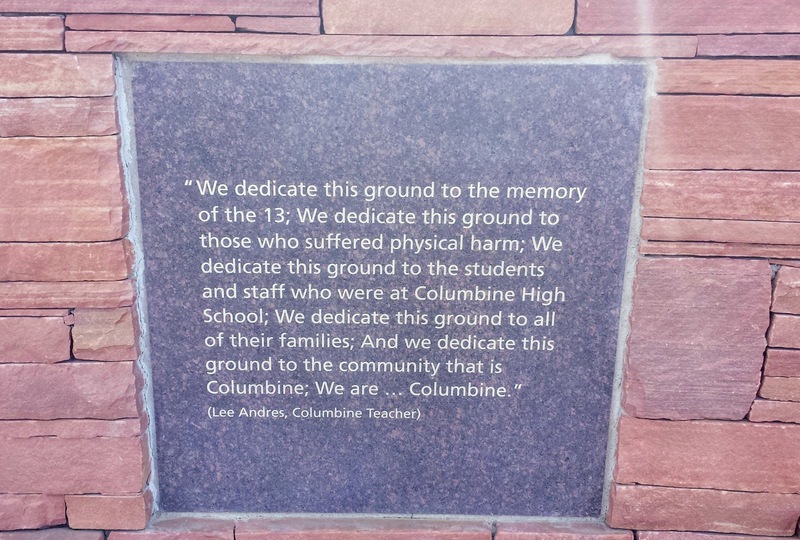 I was out of the country when Columbine happened, and remember watching the tragedy unfold on TV. It was horrific to see this happening from someplace else, realizing that the eyes of the world were on us for all the wrong reasons. Beautiful and sad post. I was in middle school when this happened. It was so scary. And the worst part is that it keeps happening. I wish so much that we were able to do something to keep this from happening in the future. It shouldn't have happened at Columbine and it shouldn't happen anywhere else either. <3. Thank you for the reminder. I do love how the students are remembering the students lost during the massacre. This is an event that is never too far from my mind, for I work in an elementary school where we practice lockdowns with greater frequency as each year passes. I think this would be a very moving thing to see, even though I'm not sure I could handle it. When I think of how my children have all grown up in 20 years and these families will never have this. To think that it still happens all over the world. Pat, you have brought us a thought-provoking post and the opportunity to ensure that we never forget. Thank you. May they rest in peace. Yesterday was so nuts with that lady. I am just glad she didn't hurt anyone but herself. Such a sad event. I keep praying there will be a time when these shootings no longer happen. It just doesn't seem possible that this terrible event was twenty years ago. I thought your post a wonderful memorial and tribute. A somber memorial. The human species can be so cruel and tragic to one another. It's hard to believe that it's been 20 years--such a sad bit of history but the memorial is gorgeous. I’m so glad you joined me at My Corner of the World this week! So much time has passed since then. I was in the Navy at he time, 1 year in. It's really sad because we as a people still haven't learned how to help people in emotional/mental need. We're still blaming access to firearms when we really need to focus on helping people who need help. However I am all for background checks and putting responsibility on gun owners to keep their firearms secured out of reach of other people. But the question still remains: how do you know someone is in serious mental/emotional turmoil? Thanks for sharing this post with us at #OMGHWW. A terrible thing that paved the way for more of the same. Even in my small town we have had threats. It changed everything. Thanks for linking up.